By the time Vine was shut down in January 2017, Thomas Sanders was already popular within and beyond the internet community for his heavy involvements on the online video hosting platform. After the tragic shutdown of Vine impacted on the growing career of the multi-talented personality, he immediately switched over to YouTube where he continued to upload his videos and other short clips on random issues relating to music, comedy, social justice, pranks, and stories. Stuffed to the brim, Sanders has so many works to show for his talents in singing, acting, scriptwriting and many more. He commands a large following on social media, has several hit singles to his name as well as many movie and television series credits. Thomas’ parents welcomed him into the world on April 24, 1989, in a city called Gainesville, Florida, which is located in the United States of America. It was also in the same city that he was brought up by his parents together with his three brothers. Sanders is the third child of his parents. After his birth, his parents welcomed another son they named Shea Sanders. Thomas is two years older than Shea but he has two older brothers called Christian Sanders and Patrick Sanders. The Sanders brothers are all responsible and talented in their own rights as well. From what we gathered, Thomas Sanders was raised a staunch Catholic and, he first developed a penchant for singing and acting while he was still in middle school. At the time, the star was a member of his school’s drama and choral groups. Talking about his higher education, Sanders was tutored at the Gainesville campus of the University of Florida, where he combined his education with community theatre. Through a dint of sheer hard work and dedication to his studies, Thomas was able to successfully graduate in 2011 with good grades and was later awarded a B.Sc degree in chemical engineering by the University of Florida. Shortly after his graduation, the famed YouTuber started to hunt for a befitting job. He later found one in an engineering organization and was employed as a daytime staff. However, in a bid to make more money in order to make ends meet, Sanders began to search for a second job. He luckily discovered there was a vacancy in one theatre company around his area and later applied as a part-time staff. To his amazement, the firm employed him and also gave him the opportunity to explore the theatre. It was during his spare time in the office that he came to develop himself more on how to make the most out of Vine. After following things up on Vine and recording success on the platform, Sanders quickly left his first job and fully switched his attention to Vine and theatre. Is He Gay, Who’s His Boyfriend? In recent time, the world has witnessed a sudden surge in the number of people coming out as gays. While some people’s decision to crawl out of the closet didn’t come as a shock, others left the world devastated after revealing their sexuality, and Thomas Sanders belongs to this class. The YouTuber, after many years of trying to deal with speculations relating to his sexual orientation, came out as a gay on the 12th day of June 2017. He also addressed several issues that followed the revelation, including claims that he is bisexual. Setting records straight in his video titled Having pride, the Vine star maintained that he is gay, not bisexual but can switch roles at any time he wants in his videos. By switching roles, he meant that he can play characters that are in love with women in his videos but cannot act in the same manner outside the internet community because he is only interested in people of his own gender. Following his coming out, Sanders has not been vocal about who his lucky boyfriend is (that is if he has one). He seems to be very comfortable with his privacy on the matter and not in a hurry to talk more about his love life. Considering Thomas Sanders’ overnight success in the online business and showbiz community, we are positive he makes a huge sum of money from his wealth of business channels. At the moment, the exact amount he makes from each business channel is not open to public scrutiny but his net worth, according to various sources, is estimated to be around $3 million. 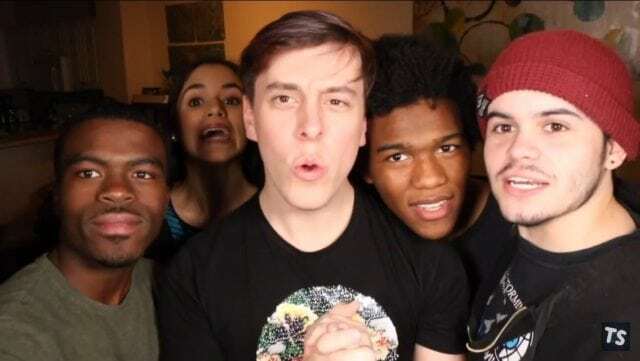 Thomas Sanders’ Height – How Tall Is He? As someone who has been in the spotlight for some time now, Sanders has come to embrace his physical appearance and other distinctive features he is endowed with. With a height of 5 feet 10 inches (1.78 m), the YouTuber can be described as average in size but taller than some celebrities still. His weight is put at 180 lb and he is super excited about it. His other body measurements are Waist: 20 inches, Biceps: 14 inches, and Chest: 39 inches. His shoe size is 11.